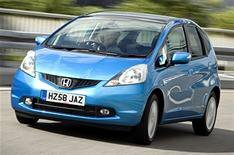 Honda Jazz hybrid on the way | What Car? Honda has confirmed it will build a hybrid version of its new Jazz supermini. The low-emission, super-economical version of the car will sit alongside the 89bhp 1.2-litre and 99bhp 1.4-litre petrol engines in the Jazz line-up. No on-sale date has been set for the hybrid, but it is expected by 2010. Honda has pledged to sell 500,000 hybrid cars a year by that date. A hybrid variant of the Jazz presents several problems, however, as the batteries and electric motor will have to be packaged along with the traditional engine. With one of the Jazz's strongest selling points being the interior space and versatility it offers, the new technology will have to be incorporated without compromising this.